Steven Lee Montgomery used an Orb Weaver spider for the ABC series Lost. When feature film or television productions want exciting, beautiful, ugly, terrifying or rare insects, animals and plants, they go to Steven Lee Montgomery, Ph.D., and Anita Manning at their Waipahu home. For nearly 30 years the couple has supplied wasps, scorpions, spiders, centipedes, cockroaches, and even maggots to TV shows and movies such as The River, Off the Map, LOST, Tropic Thunder, Raven, and Tour of Duty, as well as networks like BBC, Nova, Animal Planet, and National Geographic. But in case you happen to be the couple’s neighbors, don’t be concerned: They never actually store the creepy critters in their home or on their property, except for carpenter bees, which seek out the soft wood there. By the way, the harmless carpenter bees usually double for the more aggressive bumblebees. The secret to managing creepy crawlers, the couple agreed, comes down to understanding their normal behaviors, then tailoring those behaviors for a specific shot, and using their knowledge to fulfill the filmmakers’ needs. “If the filmmaker says they specifically want something to happen, the trick is to provide a creature we understand that can be manipulated to fill their needs,” said Manning. Ben Stiller stares down a praying mantis in Tropic Thunder. Perhaps the best example of that was on the Ben Stiller film Tropic Thunder. The director wanted the insect on a log next to where Stiller would be sitting. The premise was that Stiller’s character had been out in the jungle for weeks and he’s sort of going crazy, so he starts talking to this insect, which stares him in the face. As soon as Stiller sat down, the mantis jumped at his face. The shocked Stiller pulled back and swatted the insect, which then landed on his shoulder. Everyone on set was thrilled with what had happened. “It was so fantastic—perfect,” said Montgomery. The production did several more takes, but none of them equaled the first shot. Montgomery has played with mantises since he was a boy, so he understands the insects’ characteristics. Montgomery and Manning assisted on a Chinese milk commercial on the Big Island. The coordination is much more than simply bringing the insect, rodent or mammal to the set. “You have to convince the filmmaker when you know things about an animal, what it will do or not do,” said Manning. On a Big Island commercial last year for a Chinese milk company, the director insisted that he wanted the cow to look into the sun for an early morning shot. For an episode of ABC’s LOST, a scene required centipedes to crawl out of a skull’s eye socket. Montgomery went to his favorite centipede hunting spot, Tantalus, a wet area in the Koolau Range above Honolulu, where he snagged a few. On set it was tough to figure out how to control the horrid-looking insect, but he improvised. The only down side was that all 10 specimens eventually escaped into the surrounding jungle. If a venomous insect is going to be in contact with a human, Montgomery said he uses “a secret biologist trick”—he removes the stingers. That’s what he did on the Tour of Duty TV series. “The production brought in a centipede from Thailand and wanted the stinger removed, so they called me to do it,” said Montgomery. The problem was the state of Hawaii had confiscated it since it’s not indigenous here. “So I headed back to the jungle to find local centipedes,” explained Montgomery, who removed stingers from a dozen Hawaiian centipedes for filming. 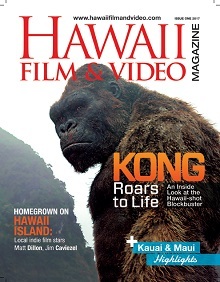 Manning emphasized that since there are no trained animal talent in Hawaii, it’s important for productions to contact them as soon as possible to detail what animals they need and the scene to be shot. Having a biologist on set as an advisor is also important, said Manning, who has a degree in anthropology and for years worked at the prestigious Bishop Museum in Honolulu. Montgomery received his doctorate in entomology from the University of Hawaii. “We can help prevent errors, like having a strictly North American or African plant in a scene,” she said. To spice up an insect scene, the couple may suggest using something unique in Hawaii called an ambushing inchworm that eats no plant matter but just lies in wait to literally ambush insects that happen by. “Of the 25 or so projects I’ve worked on, probably half of what I use have been what I call the carnivorous caterpillar,” said Montgomery. And if your blood curdles when you just think of even being in the same room with a centipede, take heart that Montgomery and Manning are never creeped out by the multi-legged demons from hell. But Montgomery admitted that centipedes have stung him three times, “and yes, it’s a real bite and a painful one,” he said. The couple makes sure that on productions when an insect will be in direct skin contact with an actor, they know the creature’s characteristics. The scene called for the spider to walk up an actress’ leg. “They do clutch the skin, but they never bite in that position,” Montgomery told the production. Nevertheless, the actress “freaked out” and refused to do the scene. 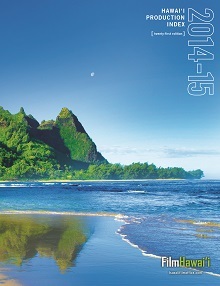 Contact Steven Lee Montgomery, Ph.D., and Anita Manning at 808-676-4974 or manninga001@hawaii.rr.com.